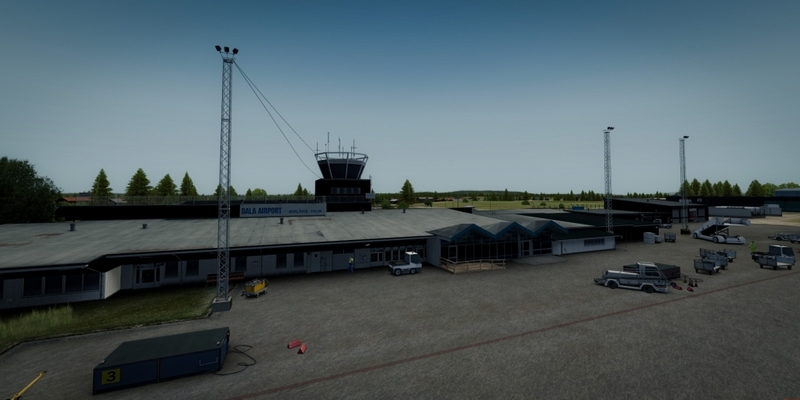 Along with Kiruna, ORBX packed two other Swedish airports. Each can take a 737. High quality, the prospect of interesting flights, and the price of a single airport make it a good deal. excellent location in relation to other sceneries. 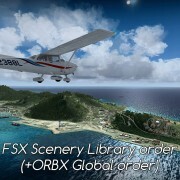 In the past ORBX has offered airports to which they added additional airports. These were sets of small airports or a larger and two tiny ones naming the package after the most significant. It’s different here. We get three airports, roughly comparable in size, i.e. 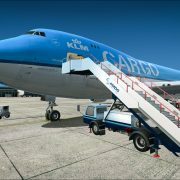 each capable of handling 737 or A320. Although named after Kiruna it is Visby that occupies the first place among them in terms of traffic. With almost double the number of passengers (467 thousand vs. 276 thousand) and over three times the number of operations (4993 vs. 1471). 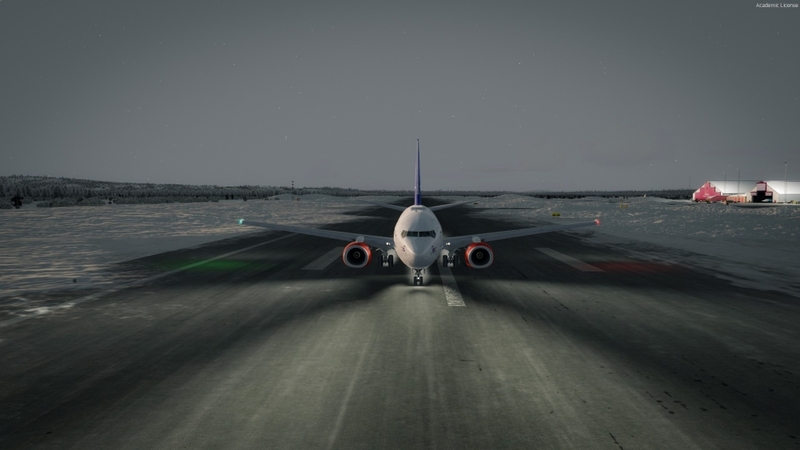 Statistics show that Kiruna in the far north more often sees 737 (on the route to Stockholm). 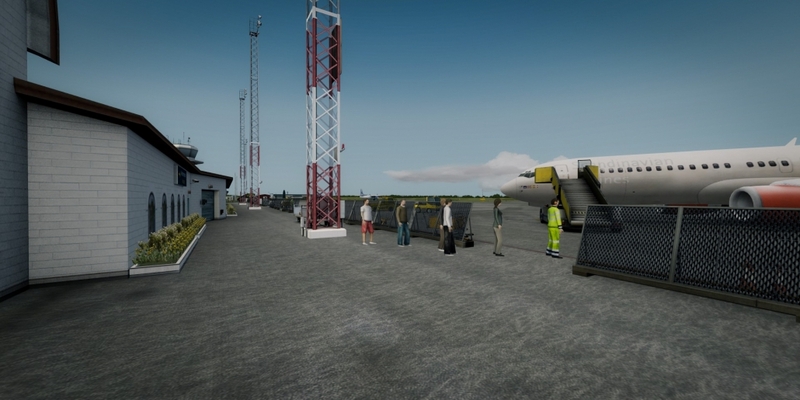 The third airport – Dala, although of similar size, lags away with just over a dozen thousand passengers. 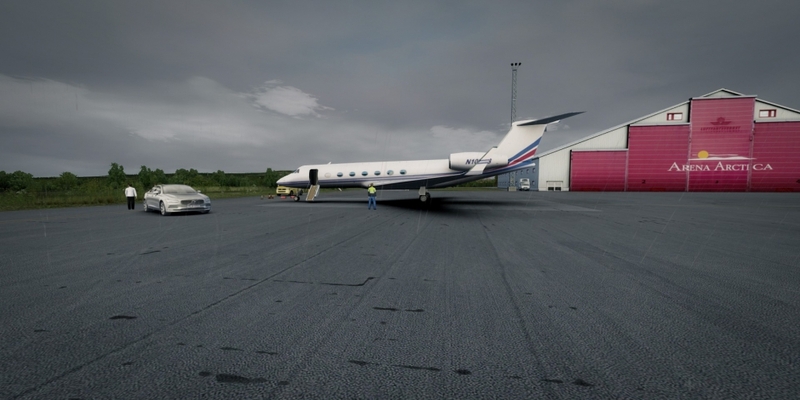 But in terms of the number of landings, it is definitely ahead of Kiruna – the number of general aviation operations goes in thousands. I must admit that I understand the choice of name. At the thought of Kiruna, I at once associated it with the airport, economy, and history. Visby, though interesting, I did not associate aviation. Red airport. My first memory of Kiruna is its color. The airport buildings abundantly and boldly use intense red. Large panels of that color (made of metal or plastic) cover the main terminal. They also painted several buildings so, and the hangars, even if kept in gray have red gates. Cladding makes The terminal stand out most. Convex plates refract light, so the red seems uneven. An intention (economy) or a bungle? Besides a bold color, this terminal is not particularly encouraging. I admire seeing in the scenery the effects that disheartened me on the real world photos. More on that in a moment. Such an economical appearance may result from the position and role of Kiruna. Established as a mining town close to the iron ore deposits, it depends on the iron mine that plays the most significant (economical) role in the region. With a small population (ca. 18,000) and small tourist traffic, it should not come as a surprise that the airport aimed at serving the employees of the local mine (aesthetically repulsive) was not designed to attract visitors with its sophisticated architecture. 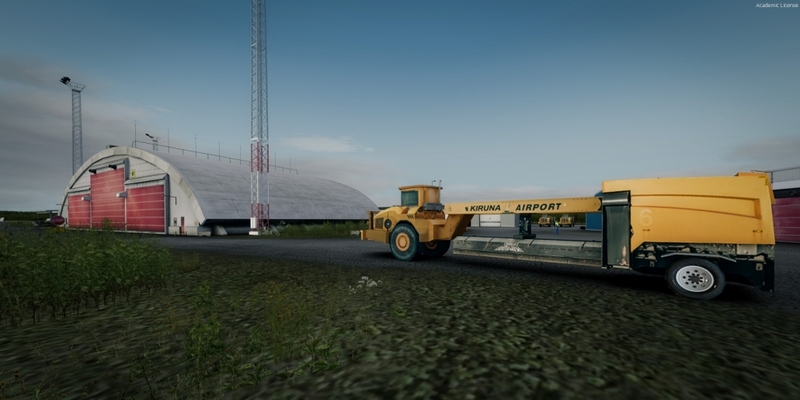 In addition, the remote location in the north (Kiruna is the northernmost airport in Sweden) rather raises construction costs than lowers them. As you probably know from my description – I did not expect to find an idyllic Swedish town in Kiruna. And I did not. For which I should give a due prize. I think it is much easier to create a sweet-looking, toyish scenery than cold and uninviting (and keep it on the highest technical level). This industrial and businesslike nature shows in this scene where a luxurious Volvo (and appropriate!) awaits in front of a business jet. Waiting to take the passenger the mine or another firm that has developed around it. 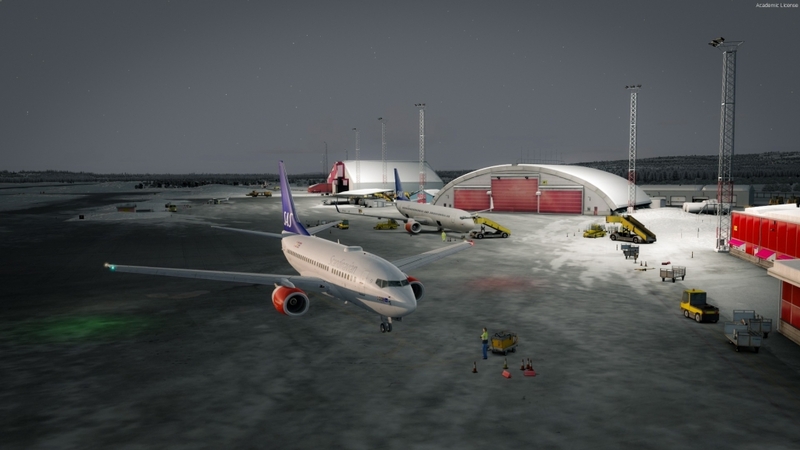 Do not ignore the Arena Arctica hangar on the same apron. It is not only a hangar but also a research center and (when aircraft are absent) a concert hall. 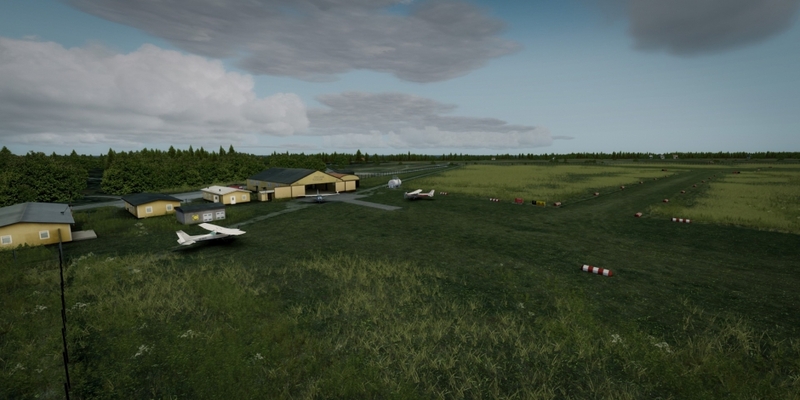 With the popularity of general aviation in Sweden, it is not surprising to see a large general aviation area with several places for small aircraft (you will find the fuel here too). By the terminal, along with space for two 737, there is a place for one more passenger plane (a smaller one). The scenery surrounding the airport provides a general idea of the town’s layout. The mine’s open-pit also attracts attention. However, I do not recommend these areas for helicopter flights – one best enjoys it from a passing plane. If you fly mostly in summer, as I do, I recommend you pay a visit in January too. 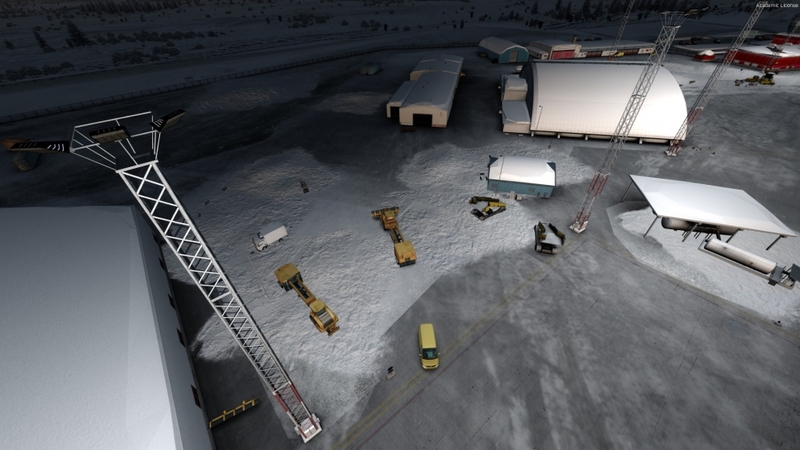 Check out this snow cover that the developer placed all over Kiruna Airport. 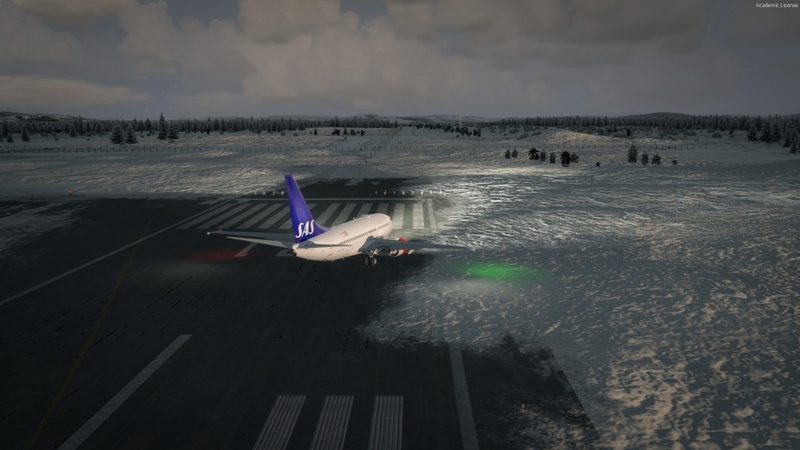 With snowdrift on the runway (first time I see this amount of snow on the runway in the sim), takeoff and landing feel much different. If I discouraged low and slow flights in Kiruna, my recommendation for Visby is opposite. Go on a trip (by helicopter). See the old city. 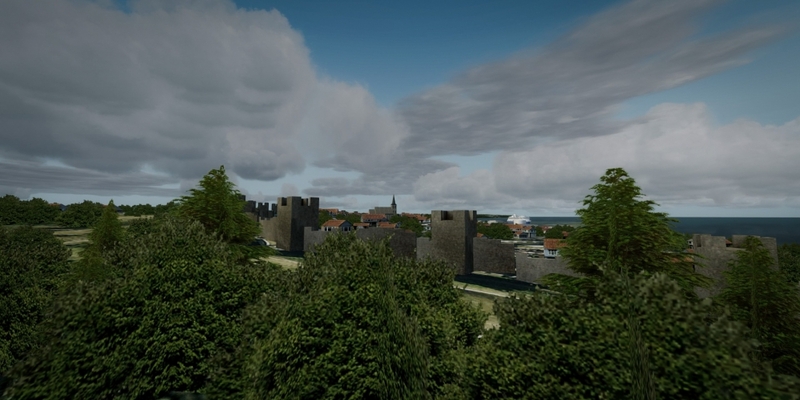 Watch the walls and towers – the reminiscent of Visby‘s medieval history. Inside the fortifications, look for the market square where you will find the ruins of St. Catherine’s. Stone arches still stand despite the lack of a roof. In winter, people skate inside. The tower nearby belongs to the cathedral. 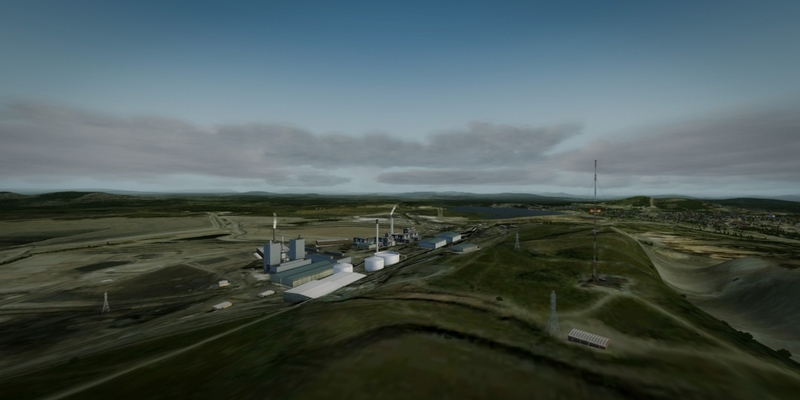 ORBX also provided a detailed model of the seaport. Despite these treatments – I have mixed feelings. Objects I mentioned encourage a visit – in this case to a trip I recommend to you. But the city itself – not so much. It is just an enhanced autogen, not a full-blown cityscape. It looks best when viewed from a distance. That makes me think it is not exactly worth a time spent on these models. 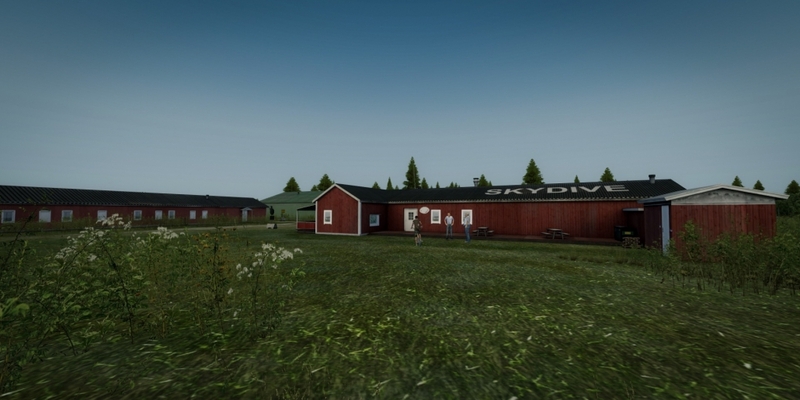 But the creator of this scenery (Marcus Nyberg) spent this time. And at the same time, he avoided overloading the scenery with performance heavy elements. This is an achievement worth acknowledging. The line about the performance applies to all three airports, it’s great! 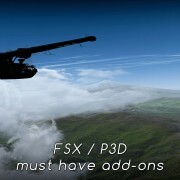 I should emphasize this – the airports are one of the lightest I have in P3D. In relation to quality, this product is my favorite. However, let us return to the airport which has a strange, complicated layout reminding us of its military origins. The Swedish armed forces still have the infrastructure here. If (against the rules!) we turn into taxiway going north from the runway – we will find two Gripens readied to fly (JAS-39 – the Swedish main combat aircraft). Such planes are periodically stationed in Visby, and Swedish government considers their permanent presence. The strategic location of the island would allow better control over the air traffic over Baltic Sea – especially the in case of Russian planes, which happen to violate Swedish airspace from time to time. 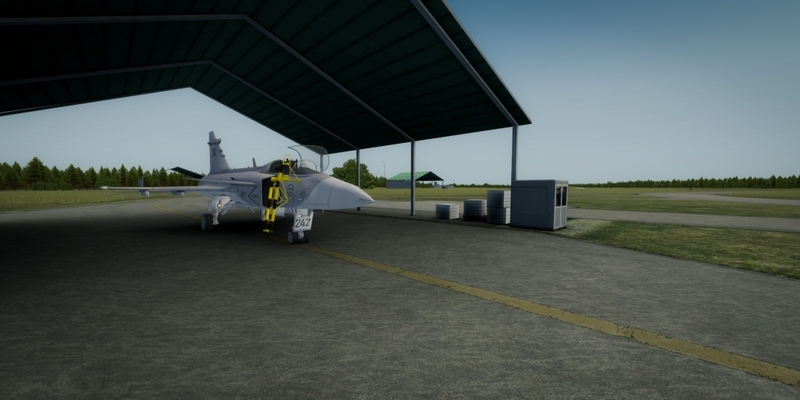 It was the Russian simulated attack on Swedish targets that from a few years ago that reminded Swedes that they need their air force in Visby. 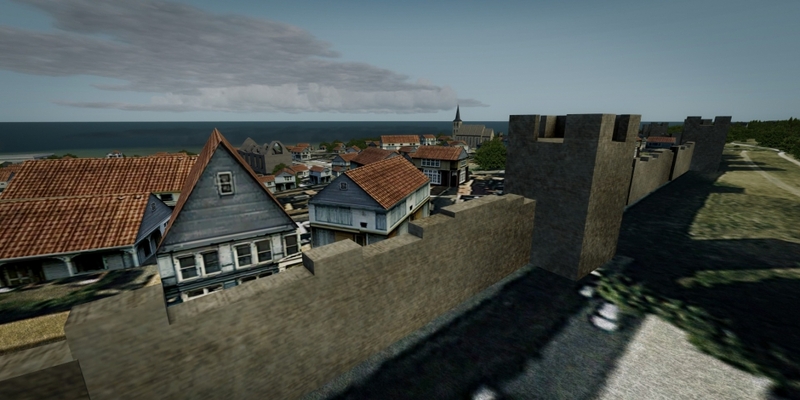 That resembles, although on a smaller scale, the role that Visby (and Gotland) played during the Cold War. Military PAPI lights are missing in the scenery. Military operations (very adequate here) must be carried out with a classic (civil) visual reference on approach. 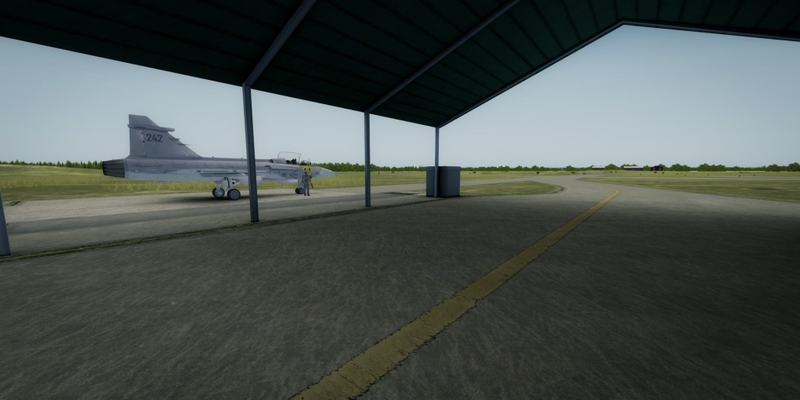 In the central part of the airport, the paved apron can handle three 737s (stands 1-3) and smaller aircraft can use other seven stands (737-600 or 737-700 with a limited amount of fuel can also use these places – they are weight limited). Small planes park on the grassy parking further south. The south side of the airport is a tangle of taxiways. First, further military positions, including “Area for fire practices”. Sounds serious. Further to the south, a grassy runway (perpendicular to the main runway and crossed by taxiway in the middle), and in the south-west – Gotland Flying Club. You can refuel here. Borlange / Dala. Or Falun / Dala. Or all three names together – depending on who is talking and what is he or she advertises. AIP uses the name Borlänge. The smallest of the airports, and surprisingly, used by Airbus 330 for a charter flights (Thomas Cook Scandinavia – airport‘s website a picture among press files). 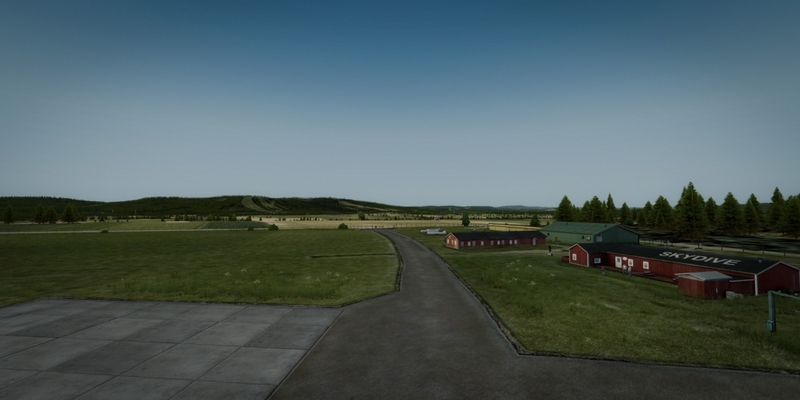 The airport (and the scenery) also reveals military pedigree (the Swedes built a lot of small airbases during the Cold War – scattering was to help survive the beginning of the war, that’s why they also used highway airstrips). Today, old military stands are disappearing, the army has left this area and only charter airlines fly from the airport to the south of Europe. There is also a flying club here. 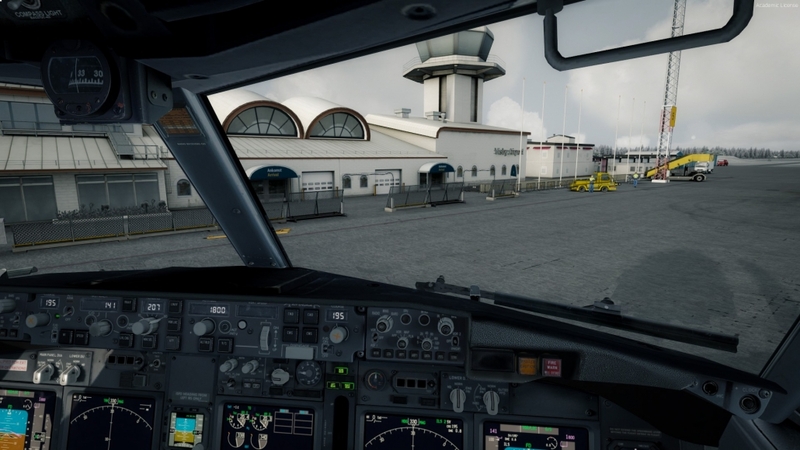 If you will use the club‘s infrastructure – take fuel, use their parking, but I do not recommend using runway here – it is poorly marked (as in reality!). 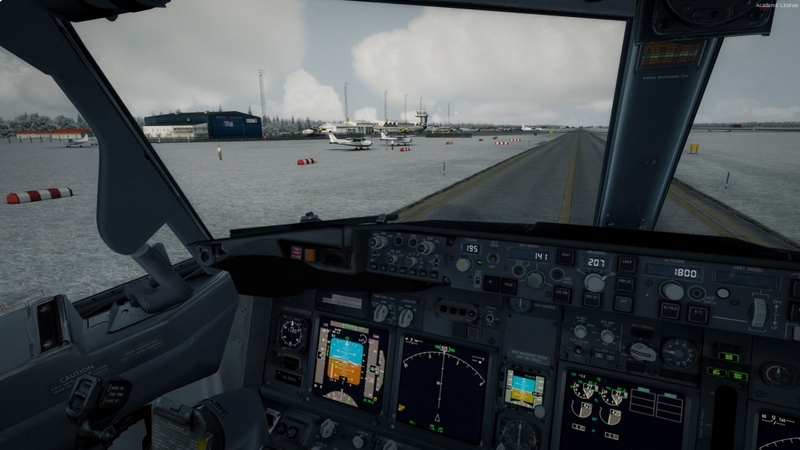 But, if you are already taxiing in the direction of the flying club, pay attention to the ski slopes on the opposite hill – the trees are nicely cut in the scenery (the author took care of the correct placement of the autogen even in places that far from the airport). 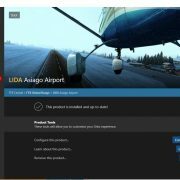 ORBX website mentions “famous red houses” near the airport, something that seems particularly noteworthy. With autogen (and these houses), I have a similar impression as in Kiruna and Visby – it performs its role perfectly by marking built-up areas and giving them depth and feel. But it is not the autogen (and red houses do not change it), which could become the target of the trip. It’s not a complaint – it’s all about the airport’s scenery and the author should focus primarily on the performance (which has succeeded!). The area around the airport is an addition. In my opinion – the balance between the level of detail in the surrounding area and the load has is perfect. 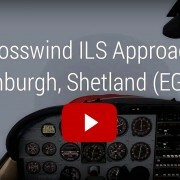 I enjoy my approaches and I enjoy flying patterns here. 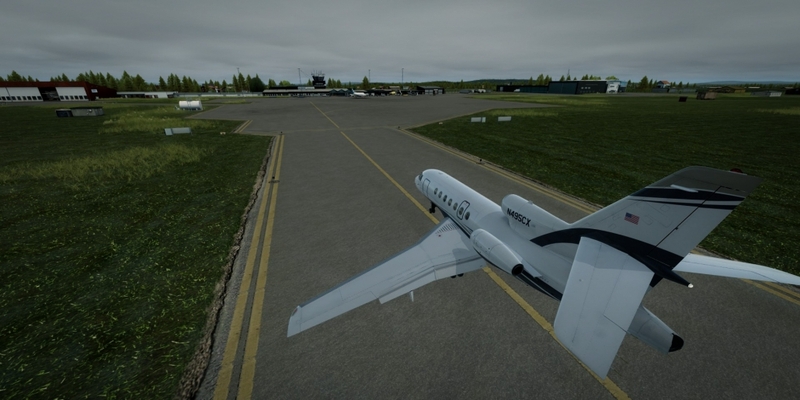 These three airports are located at such a distance you can fly between them both with a small plane (Dala-Kiruna makes a 3.5-hour flight in a Cessna 182, Dala-Visby is an hour and twenty minutes) and 737 (much shorter flight times). 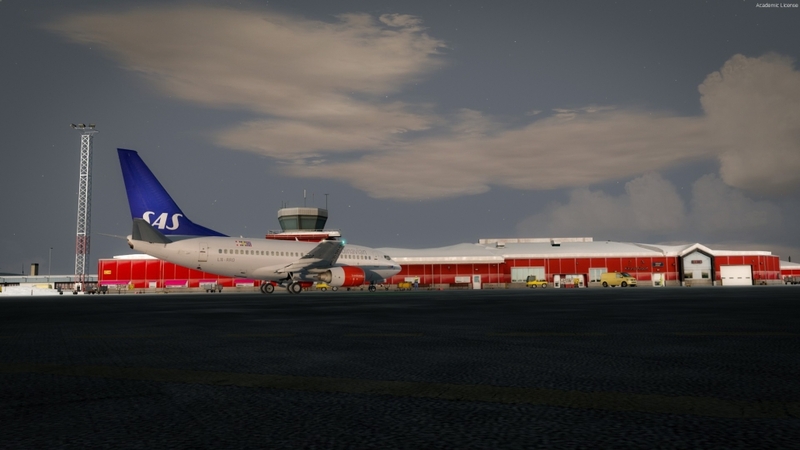 ORBX also made Stockholm Arlanda, a perfect complement (I own it and I flew a lot between Visby and Arlanda and from the capital of Sweden to Kiruna). 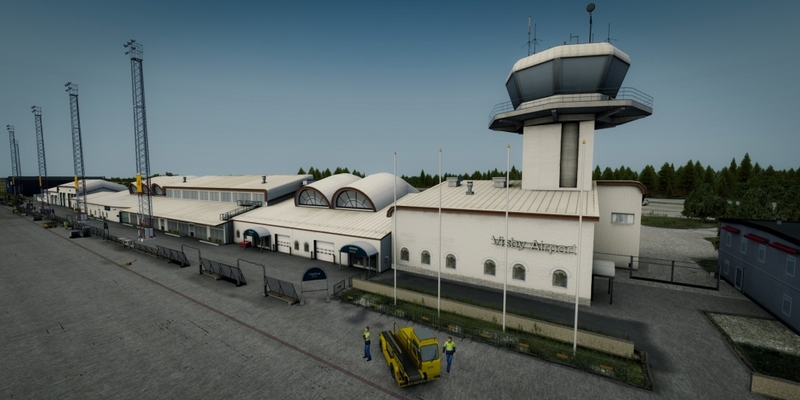 Nearby Norway offers more airports – by ORBX and other developers. In other directions, you will also find interesting sceneries. It’s impossible to get bored here. Three airports that combine high quality with a negligible load in my PC. 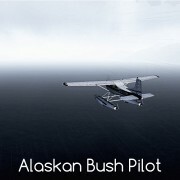 And, they offer interesting opportunities to fly (even with no other scenery). These are the advantages you can not ignore when choosing the scenery. I became enchanted with Kiruna, Visby, and Dala.